ISO has released a survey for members only — specifically management system Technical Committees that draft management system standards like ISO 9001 and ISO 14001 — asking about their experiences with Annex SL and the “high level structure” (HLS). At first it’s a bland affair, but scratch the surface and things get a little more interesting. A quick primer: “Annex SL” was a mandate written by the secretive “Technical Management Board” (TMB) and then forcibly pushed down to all TCs, which demanded they format their work products (the standards they write) to align with its paragraph structure. The effort was begun in secret in 2004, and then formally announced in 2006, and was intended to ensure that one ISO management system standard (MSS) looked like the others, making usage of multiple MSS’s a bit easier. The ISO team working on this deviated quickly, however, and requested additional authority not only to use Annex SL to mandate paragraph structure, but also actual content. ISO granted them this authority, despite that being a major violation of both ISO’s own procedures and WTO regulations. Such standards are supposed to be developed by official international delegates, chosen by each country to represent them, and comprised of actual experts in whatever subject the MSS purports to standardize; quality assurance experts, for example, should write ISO 9001. By allowing unnamed ISO bureaucrats to dictate content via Annex SL, ISO violated this key principle. Now, major portions of all ISO management system standards were not written by appointed delegates from member nations — who pay for that privilege, by the way — but instead they were written by ISO itself, and then made to look as if it was written by volunteer delegates. It was a shady and nefarious trick. ISO insists it put Annex SL out for a vote, but the content was already written, and the voting for it was … complicated. First they tried to release it as an official ISO “Guide,” a sort of mini-standard format they sometimes use, but while Guides require official voting, they can be written by ISO instead of the world’s delegates. When that didn’t get the worldwide support ISO wanted (only 19 countries voted to approve it), they scrapped the Guide, and re-released the text as an Annex (numbered “SL”) to a set of mandatory internal procedures instead, not subject to any voting. 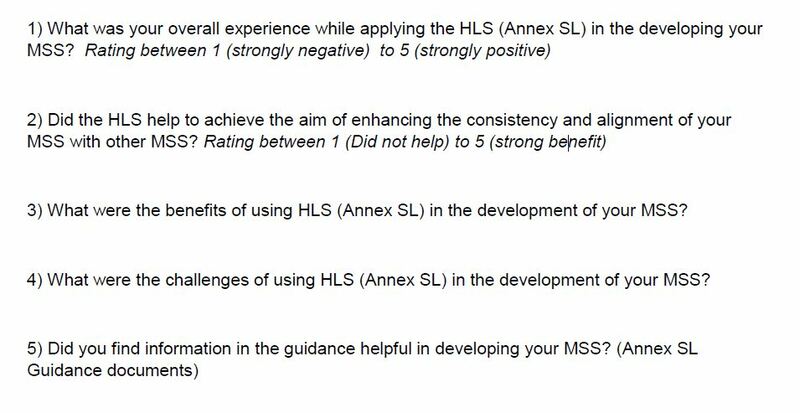 ISO later said Annex SL was voted on, but they fail to mention that this happened at the Guide step, which they then scrapped. Since then, Annex SL has only been supported by three of the usual suspects: ISO and its worldwide publishing partners (like ANSI), the registrars who use Annex SL as a justification for demanding additional “upgrade” audits, and private consultants who provide training on Annex SL. In short, the only people who like it are the ones who can monetize it. Everyone else — like the actual users of the ISO MSS’s — hate it. The most confusing, poorly worded and needlessly complex clauses like 4.0 “Context of the Organization” and 6.1 “Actions to Address Risks and Opportunities” were pasted from Annex SL, under mandate. They weren’t written by the TC authors at all. The world is rejecting Annex SL and the latest updates to the ISO standards with resounding noise. The automotive industry snatched away TS 16949 from ISO entirely, and is now independently publishing it as IATF 16949, robbing ISO of lucrative licensing and copyright revenue. A similar move is being pushed by a faction of developers in the aerospace field, who want to publish the next edition of that standard as IAQG 9100; they even trademarked the word “AS9100” so ISO couldn’t use it without permission, reversing the typical power structure. Even key authors and supporters of Annex SL have had to concede that it’s been a disaster. One of authors, Dr. Anne-Marie Warris, begrudgingly admitted that Annex SL was being misinterpreted by registrars, and as a result, ISO’s sales would drop. This was after she had previously told her peers everything would be just fine, and to play along. So it’s both ironic and revealing that only now does ISO bother with a “survey” to gauge opinion on the thing they’ve been working to mandate since 2006. 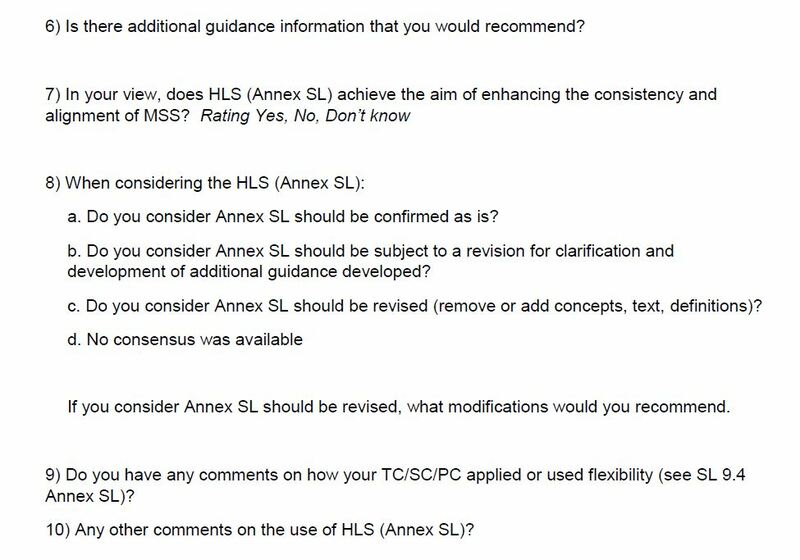 ISO has released the survey for TC members only — they still don’t want to risk surveying the public, since they know what the result will be — asking them what they thought of Annex SL and the HLS. It was clearly written by one of the Geneva bureaucrats, since the English is garbled and halfway through the survey they switch gears to ask questions from an altogether different time perspective. Question # 2 is interesting, and it shows how insulated the ISO HQ is from the people who write its standards. By asking “did the HLS help to achieve the aim of enhancing the consistency and alignment of your MSS with other MSS?” it shows the Geneva bureaucrat who wrote the survey has no clue what TC members actually do. First of all, TC’s are only tasked with writing a single MSS about a single subject: TC 176 for quality management, TC 207 for environmental management, for example. The members of one TC do not care at all about how their work product synchronizes, or does not synchronize, with the work products of other TCs. They are tasked with being concerned over their subject of expertise; only ISO cares about the bigger picture: selling multiple standards about any subject imaginable. Next, the question ignores the other fact that the various ISO TC’s hate each other, and often squabble. The TC 176 folks really don’t care at all what the enviro-nuts at TC 207 have to say about anything. And everyone hates the people at TC 262 which oversees risk management standards. ISO doesn’t get that. It’s only the ISO publishing machine that cares about aligning standards; the individual committees don’t care since that’s not their area of focus. It also shows that ISO blinked: while it presents a straight face to the public and all its stakeholders, internally ISO has been outright distraught over the disaster that is Annex SL and the overwhelming negative feedback it’s gotten. Question # 8 reveals that are already thinking about revising Annex SL, something that was previously deemed unthinkable when it was produced. It proves that ISO failed in standardizing its standards, which is both ironic and meta at the same time. ISO has only one job, after all. As usual, the survey is totally non-binding and is being tightly held close to the vest so that no one ever reads the final results. If it gets positive feedback — which may happen, since they are targeting the same people that refused to object when Annex SL was imposed on them the first time — you might see some survey results. But if the results are negative, this article is likely the last thing you will ever read about it. ISO makes a lot of money when it issues a revision to each MSS. But in the past, it knew not to abuse this and fell into a secret agreement to keep “major” revisions of standards like ISO 9001 to every other edition. Someone at ISO probably counted the beans and said they could rake in a lot more dough by doing major revisions more frequently. Now ISO is clearly considering a reboot of Annex SL, which would then prompt a “major” revision to ISO 9001 in less than five years, not the usual 15 years they take between such big rewrites. Someone at ISO thinks they can not only fix the mess that Annex SL made, but maybe collect a lot of dough doing it. In reality, the move will ensure the world’s governments move further away from relying on ISO as their go-to “privatized standards development body,” and earn even more scorn from an already weary customer base. Keep in mind that now that the HLS was put into Annex SL of “ISO/IEC Directives, Part 1: Consolidated ISO Supplement” procedures, it’s not subject to any international input, voting or review and approval by ISO member nations. That’s a mandatory procedural document that all TCs and members must follow, with their only recourse being that they can quit ISO. If you’re not happy about Annex SL, or want to give your own feedback on it directly to the ISO Technical Management Board, write to TMB’s Secretary Sophie Clivio at clivio@ISO.org. Ms. Clivio has worked at ISO since 1992, so it’s clear she has never had to actually use any of her employer’s standards, so your feedback might be enlightening, assuming you get past her “delete” button.